Anolon Suregrip™ Bakeware is engineered to meet the needs of today’s serious home baker who demands superior performance. 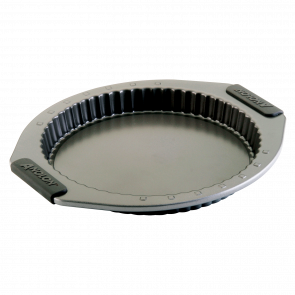 Anolon Suregrip™ bakeware is constructed from heavy gauge carbon steel to prevent warping, and is coated with a superior quality 2 coat non-stick surface to allow easy food release every time. The heavy gauge construction also provides modulated heat distribution for perfect baking results. Anolon’s innovative, durable and ergonomic Suregrip™ handles provide a safe, soft and confident grip.